While a student at DAC, Alex Endert (Ph.D. computer science 2012) worked with his advisor Chris North on a user interaction technique for visual analytics (semantic interaction) that helped adjust analytic models by computing on simple, well-understood interactions. For example, by highlighting a phrase of text or grouping a pile of documents adjusts underlying algorithms they can help people without data science training make sense of large amounts of text quickly. This line of research ultimately led to Endert’s dissertation, and grounds much of his research today. Since 2014, Endert has served as assistant professor in the School of Interactive Computing at Georgia Tech. 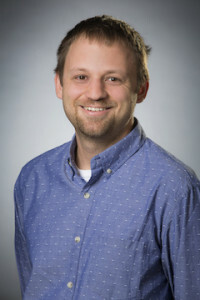 He is a recent recipient of two major awards, the prestigious National Science Foundation (NSF) CAREER award and a $2.7 million grant from the Defense Advanced Research Projects Agency (DARPA) Data-Driven Discovery of Models (D3M) program to develop new techniques to make machine learning in data science more accessible to non-data scientists. In an interview, Endert shared some thoughts about his experiences at DAC, the best part of his job, and a few personal snippets. How did you wind up at DAC? Honestly, I was browsing the lab websites, saw Dr. Chris North’s site, and saw it had a massive, 50-monitor large display. I thought working on such technology would be awesome. Interestingly enough, my dissertation ended up having less to do with large displays, but I recall that being one of the reasons I was initially interested in Virginia Tech and DAC. So, I went up to Blacksburg and chatted with Chris. So your advisor had a lot to do with your decision? Yes, meeting Chris ultimately led to my decision. The advice I got from many colleagues and current students is that having a similar style of research as your advisor is important, and in the short time meeting Chris, I got that sense. You worked at Pacific Northwest National Laboratories for two years before joining Georgia Tech. What brought you back to academia? It was a wonderful experience. I was able to perform applied research, work with really great people, and learn a lot from many of them. But I missed working with students and that is what led me back to academia. Mentoring Ph.D. students, and helping them achieve their career goals is what I like best about my job. As a DAC student I learned many skills about how to be an effective advisor. Thanks Chris! How else did your experience as a Ph.D. student influence you? I often reflect on my time at Virginia Tech and DAC. Beyond the advising skills I already mentioned, research accomplishments, and graduating successfully, I recall many experiences that helped shape my research interests. For example, the multi-disciplinary nature of the Discovery Analytics Center connected me with colleagues outside of my immediate area of research and illuminate challenges at the intersection of HCI, visual analytics, and data science. Those challenges are becoming more important as our culture becomes more data-driven. Any advice for current DAC students? Take advantage of having students and professors nearby who are not directly in your area of research. Chat with them over coffee about your work, and listen to their feedback. When you graduate, it is likely that you will be communicating or selling your research to people who are in nearby — but not identical — fields. What is the most important thing you learned at DAC? While impactful research is challenging, it can also be fun! Speaking of fun, any interests/hobbies? I have grown to enjoy hobbies that get me away from technology, such as camping, fishing, golf, hiking, etc. My most recent experience was going ice fishing for the first time. That was great, but perhaps a little too cold for my liking. I still pull for Virginia Tech football. Let’s Go, HOKIES!